Unfortunately, some people translate it to mean; ‘they scheme and Allah schemes and Allah is the best of schemers’. This is not proper to say as Allah is not a “schemer”. Man puts forward a plan and Allah also plans, and His plan will always be the best as He says that He is The Best of Planners. We see this occurring time and again in history. In order to expound on this we reference two examples. Firstly, whether it is true or not according to the Bible Sarah didn’t want the son of Hagar to share in the inheritance of Abraham (as) material acquisitions. She said ‘the son of a slave cannot inherit with my son’. But look at what Allah did, He sent Hagar and Ishma’il in the wilderness, out of the dimension of Abraham’s property. Based on the accounts in the Bible, Sarah’s concern was wealth and property (Allah knows best if this is true or not). So while she was left preoccupied with this concern, Hagar and Ishma’il were blossoming and developing with a greater purpose. Allah says of Prophet Ishma’il (as) that he was Haleem (someone willing to forbear with patience). Look at Allah’s plan. He guided Abraham to leave Hagar and Ishma’il near to the foundation of the Holy Kabaa and a few years, later both father and son re-constructed the Holy House of Allah. Allah wanted to preserve the willingness of submission of this blessed family so He created the institution of Hajj which is the re-enacting of some rituals associated Abraham, Hagar and Ishma’il. To this very day millions perform these rituals every year. And look at the condition of the Israelites, there are still obsessed with material acquisitions as they are still fighting of land. From a very despondent situation Hagar and Ishma’il were in fact fulfilling this great plan of Allah, which at the time would have seem farfetched using reason and logic. The other example which demonstrates the Wisdom of Allah’s is the story of Prophet Joseph (as), throughout his life, he was faced with hardships and the unfortunate schemes of the people around him. But look at the plan Allah had in store for him; and all the difficulties and hardships that people dealt him had wisdom in it, as Allah’s plan was slowly being materialised. Whosoever puts faith and trust in Allah, He will send blessings upon them and continuously guide them. A beautiful example of this is when Abu Bakr (ra) received salutations from Allah. The Holy Prophet Muhammad ﷺ requested contributions for an expedition, and the Muslims gave whatever they could give, but Abu Bakr Siddique (ra) exceeded all by giving all that he had without leaving anything for his own family. He even included the clothing he was wearing. Thereafter he appeared in front of the Holy Prophet wearing a sack held together by date thorns. When the Prophet asked him what he had left for his family, he replied, “Allah and His Messenger are enough for them.” When Allah saw this expression of love of Abu Bakr (ra) He ordered Angel Jibraeel to go to the Holy Prophet and say, ‘Allah has sent salutations (salaam) to Abu Bakr and asks if he has at least left food at his home and if he is pleased with Allah’. When Abu Bakr (ra) heard this he went into a state of ecstasy, began whirling and began crying out repeatedly, ‘I am pleased with my Lord!’ This story which is narrated by Ibn Asakir (ra) is recorded in both Tirmidhi and Abu Daud. Abu Bakr (ra), one of the wealthiest persons, gave everything for Allah’s sake and pleasure and when he was left with nothing Allah sent salutations to him. 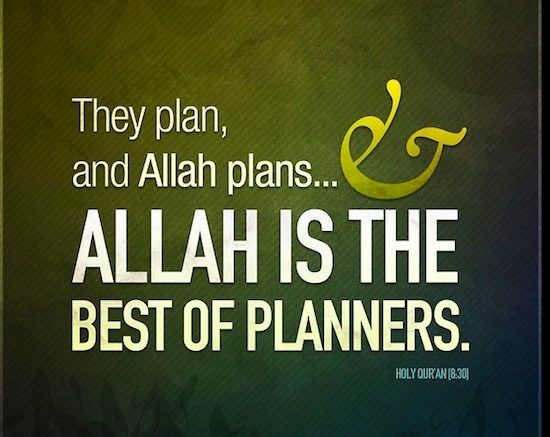 Those who put their affairs in Allah’s Hands, He will help them to plan properly. No one is as Wise and Knowledgeable as Him. It is only a question of faith and desire to get close to Him. People can do what they want but if you have Allah and His Rasul what else do you need. There are so many things in this world that can bring about emotional unrest but if you have sincere faith in Allah He will send a way out for you as He says in His Holy Words. And what appeared to be hardship and difficulty may turn into something favourable. We beg Allah to make us from amongst those who will put out faith and trust in His Hands and may He make us accept His plan and take care of our affairs in both worlds. Be the first to comment on "The Best of Planners"